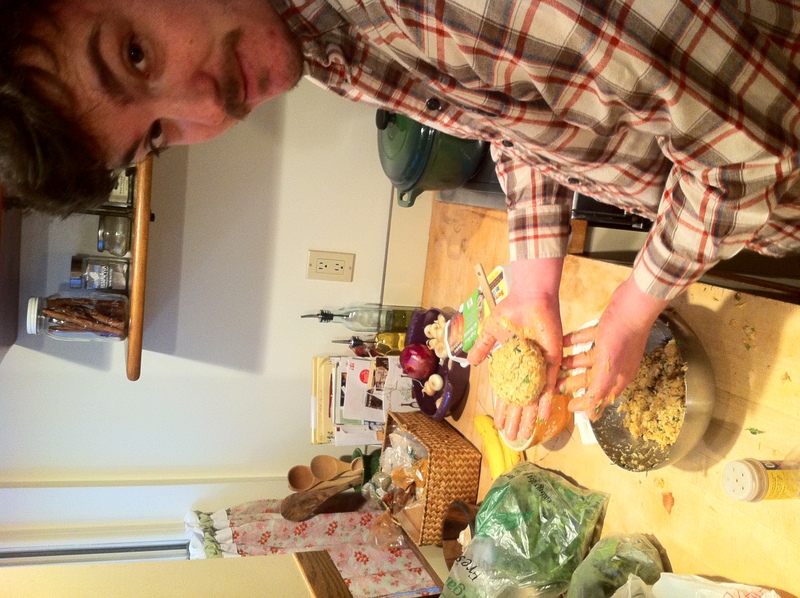 And not just some easy-to-make-half-store-bought dinner… He decided to try making crab cakes. He went to market and was inspired by the seafood counter I think. I am much appreciative and I have to say it was down right delicious! He started with picked crab claw meat and started to follow a recipe but then added a little of this and that as he went. I do know the secret ingredient was Ritz crackers but I wasn’t totally paying attention after that. 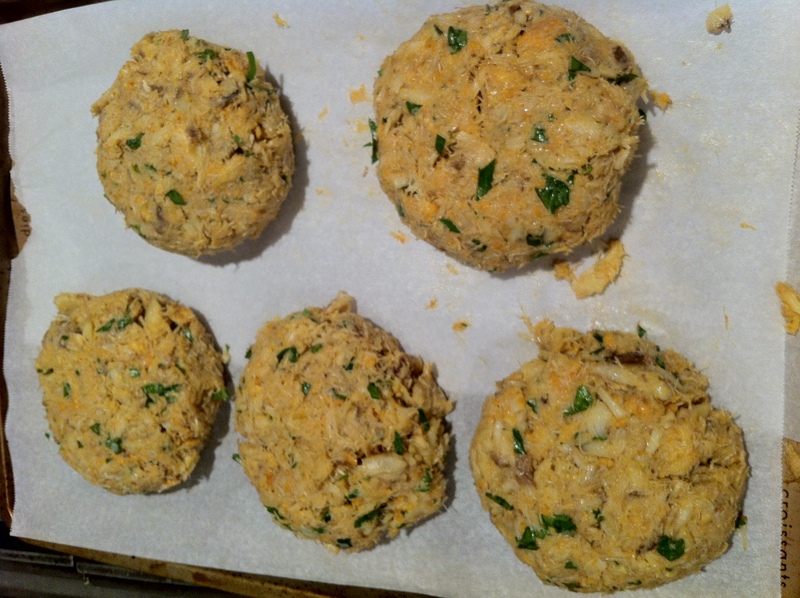 The crab cakes went in the refrigerator for a little while so they could set. I made the tartar sauce using my homemade pickles, a little bit of raw onion, lemon zest, fresh dill and parsley, and mayonnaise. I mixed it right in the mayo jar and it worked out great. 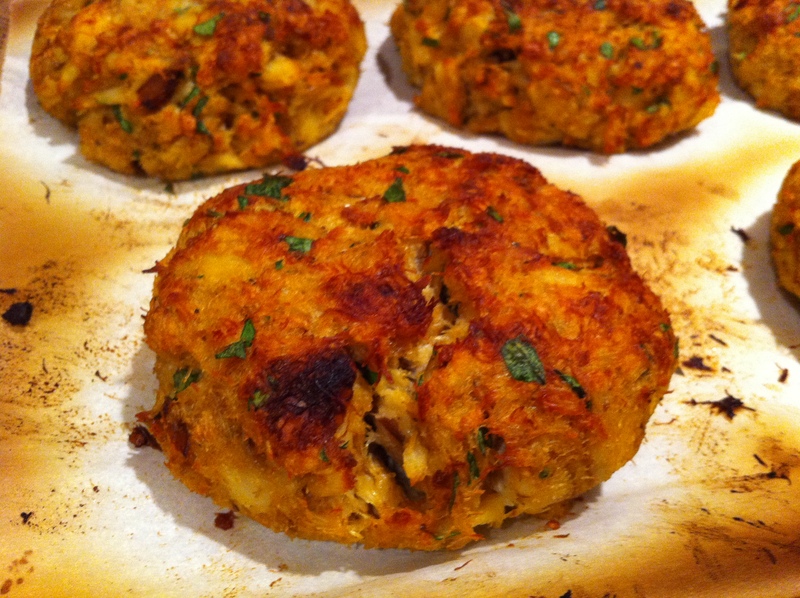 Dan cooked the crab cakes under the broiler and they came out nice and golden brown. 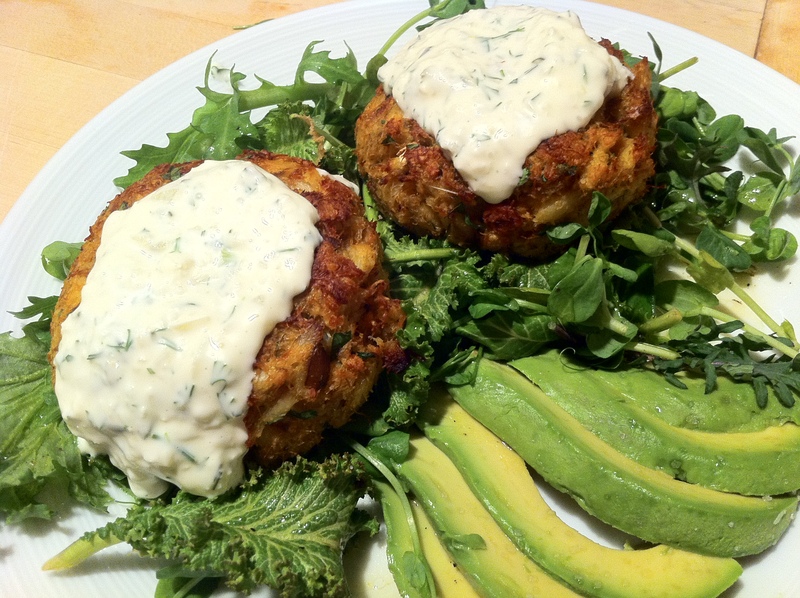 He placed them on top of mustard greens, baby pea shoots and avocado slices. He also mixed up a vinaigrette using the olive oil and mango balsamic vinegar that I got from Global Gardens. What a great dinner! Thank you Dan! I am kind of kidding, I don’t know if bake sales are really a joy… but they are a great way to raise some money! We are currently having a bake sale at the school where I work. We are raising money to send exchange students to Japan. I was lucky enough to have been a chaperone for exchange students 2 years ago. I got to travel to Sano, Japan – a city about the size of Lancaster, PA. It was a great trip filled with many culinary firsts for me. I loved trying everything! I’ll save that story for another post. I have had to raise a lot of money and I have planned a lot of bake sales through out the years I have been teaching. I have learned that a bake sale is not always as easy as it seems. You think you just ask for donations, set up a table, and make sure you have a money-box… right? So I learned to ask for donations, and ask again… and again. I learned to make sure you have lots of change in your money-box to start out with (lots of items at 50 cents means making lots of change). One of the biggest things I learned was about packaging your goodies. I thought that we would just set up the baked goods and people would take what they want and eat it. What I found was that people wanted to take their cupcakes, brownies, and cookies with them. If I wanted to sell more items, I would have to find a way to package them. 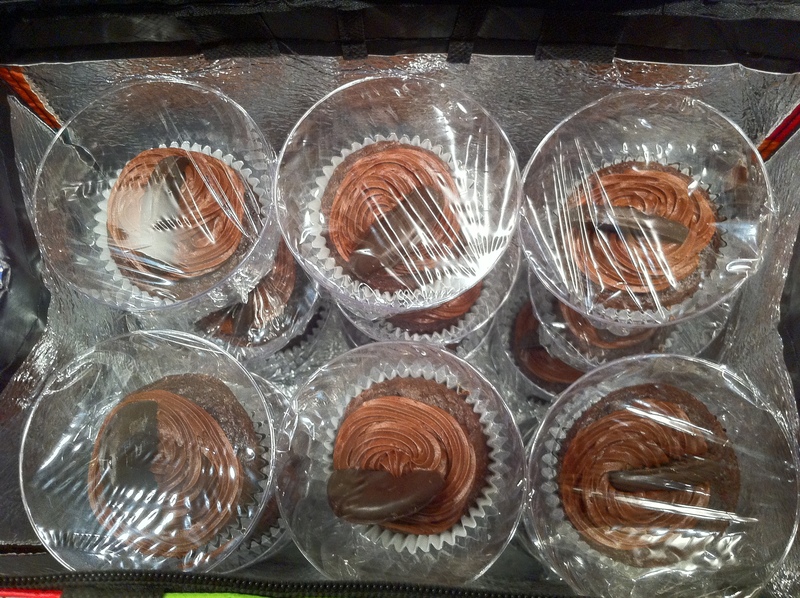 At the first bake sale I planned I got a lot of donated baked goods but I didn’t bring plastic wrap or baggies. I didn’t have anything to wrap items in. The next time, I came prepared with packaging items and I asked people to bring their yummy donations individually wrapped. Bake sale success! I am not running the bake sale going on at school right now, but of course I donated some sweet treats. I volunteered to bring two dozen cupcakes. I was really pressed for time last night so I couldn’t make my favorite devil’s food cupcakes. I came up with a fast alternative that uses store-bought cake mix and icing, and I put a little twist into them to make them my own… I feel like Sandra Lee. Follow the directions on the cake mix box to make your batter. 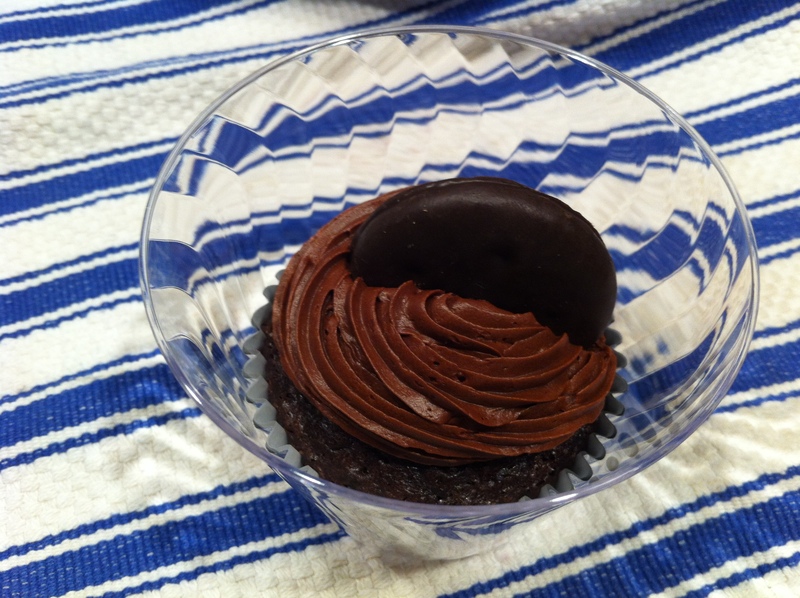 Save twelve thin mints to use for garnishes on your cupcakes. Crush up the rest of the thin mints into a bowl and mix them with 1/4 cup of flour to coat them. The flour will help them stay suspended in the cupcake batter instead of sinking to the bottom. Fold the flour coated crushed thin mints into the batter and scoop it into two muffin pans (making 24 cupcakes). Bake according to box directions. Let the cupcakes cool and pipe the icing onto the tops in a swirl pattern making it come up to a peak. Place 1/2 of a thin mint cookie into the icing to decorate. 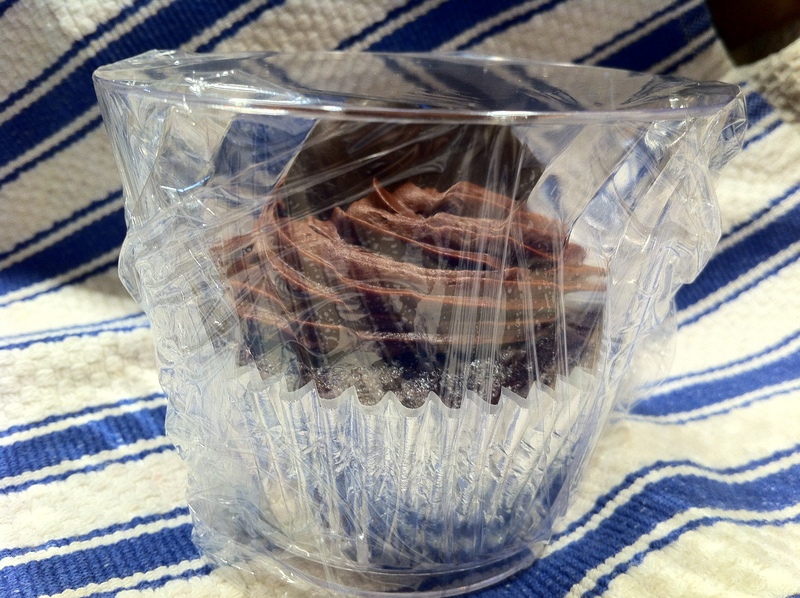 Here’s a great packaging idea for cupcakes that are traveling to a bake sale: put them in cups! I used the clear disposable wine cups that you can find at any grocery store. Place the cooled cupcake into the cup before you pipe the icing onto it and decorate it right in the cup. It’s a lot easier to get into the cup before the icing and decorations are on top. I wrapped mine with plastic wrap. It was a great way to be able to stack them on top of each other for transport. You could also use clear cellophane bags and tie them with ribbons to make them look really pretty! Here are mine, ready for transport – I used a reuseable insulated grocery store bag to transport them, not really fashionable but it kept them safe and a little cushioned. Happy Valentine’s day to all of you lovers out there! 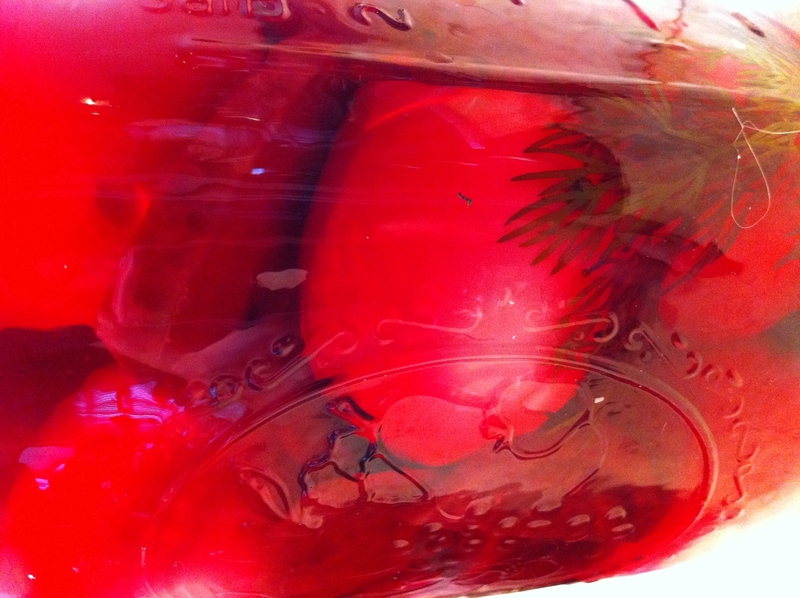 2 dozen Pickled Beet Eggs… They are red and he loves them! I made a few small jars of pickled red beets about a month ago to use for this project. To make the pickled beets I used thinly sliced beets, dill, and garlic in small 8oz. size jars. I use the brine that I use to pickle everything for both the beets and the eggs. They came out pretty good but they didn’t really get soft like the pickled beets you buy in the store. I haven’t been canning my pickled veggies so nothing I have been making has been getting soft. I like them to stay crunchy, so I have been sticking with “refrigerator pickles” so far. I think I am going to try canning the beets next time to see how they come out. I hard boil the eggs by placing them in a large pot, covering them with water, and bringing the water up to a boil. When the water boils, cover the pot with a lid and turn off the heat. Let the eggs sit in the pot for 15 minutes (for large eggs). Remove the pot from the stove and drain the water. I peel the eggs under running water to cool them as I peel. The running water also helps the shell peel off… though I still am not very good at peeling them well, so I’m not sure if this is the best method. Next time I am going to try this. The eggs go into two Ball quart size jars with 10-15 whole black peppercorns, 1 bay leaf, 10-15 whole coriander seeds, a sprig of dill, and a smashed clove of garlic. I split the small jar of pickled beets (with their brine) between the two jars of eggs. Cover the eggs with warm brine (3 cups water, 1 cup aged white wine vinegar, 2 tbsp salt) and close the lid. I think they taste the best after they have pickled in the refrigerator for 3-4 days. They turn a very pretty purple-red color that looks amazing next to the yellow yolk when you cut it in half. I plan to try to make special deviled eggs with pickled onions and dill one of these days out of the pickled beet eggs. I’ll have to hide the batch if I ever want to make anything with them because Dan devours these every time they are in the refrigerator. I hope you enjoy them as much as he does! 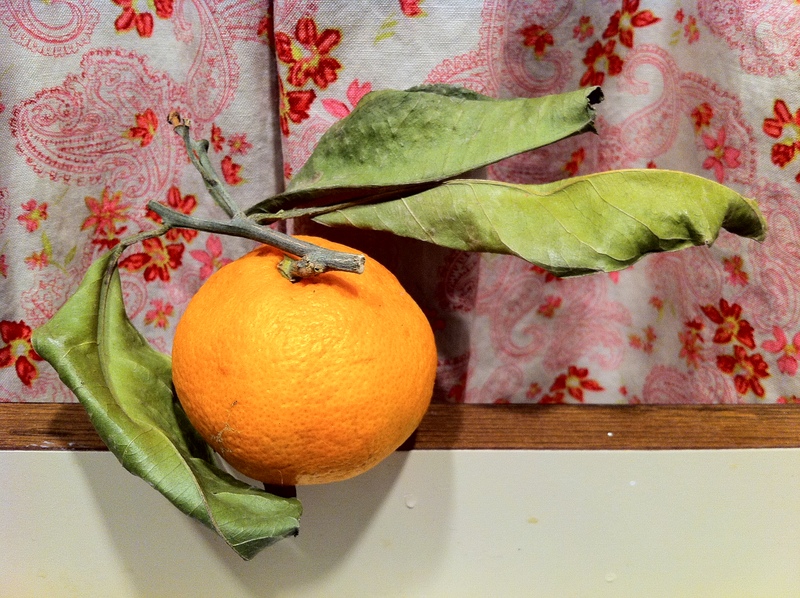 Check out this orange guide from Kitchen Daily. 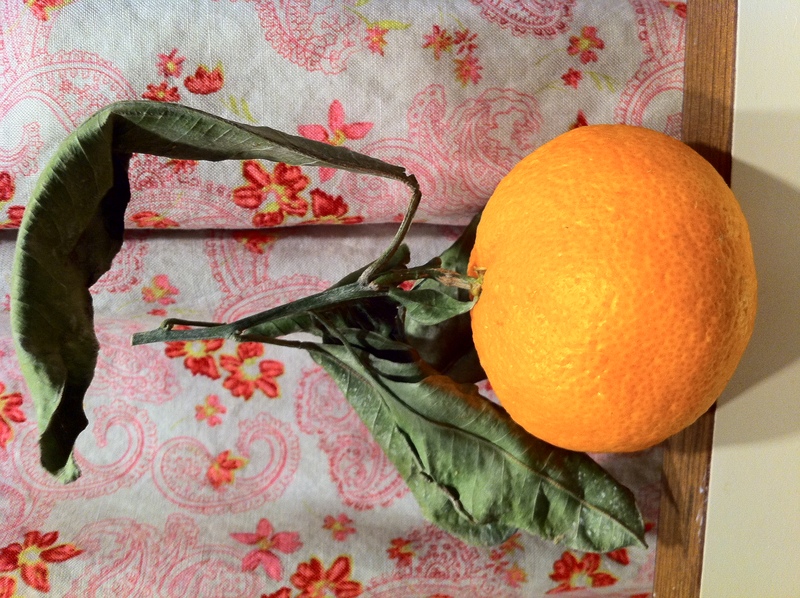 It shows photos and descriptions of orange varieties and when they are in season. 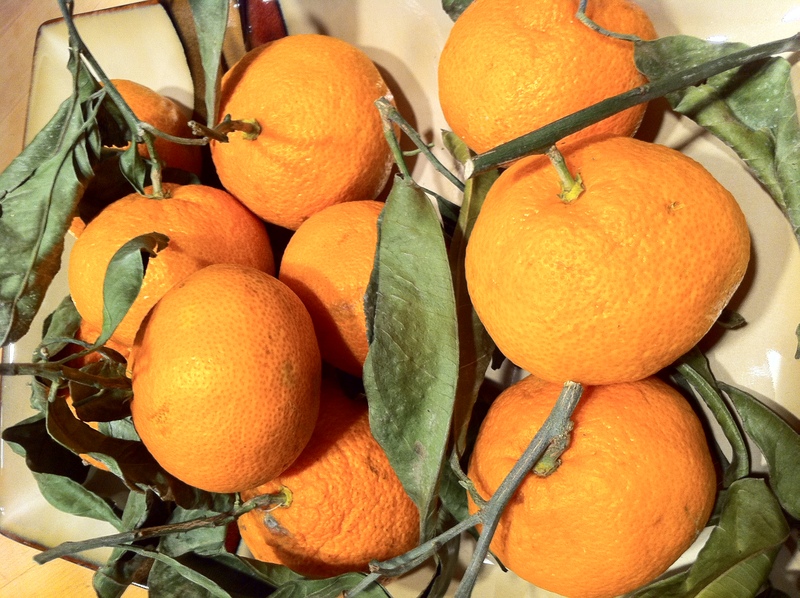 Winter is such a great time for a lot of citrus fruits. My favorite is the clementine. I can eat clementines morning, noon, and night. Easy to peel, sweet, juicy… they are the perfect snack. I buy them by the crate when they are in season. 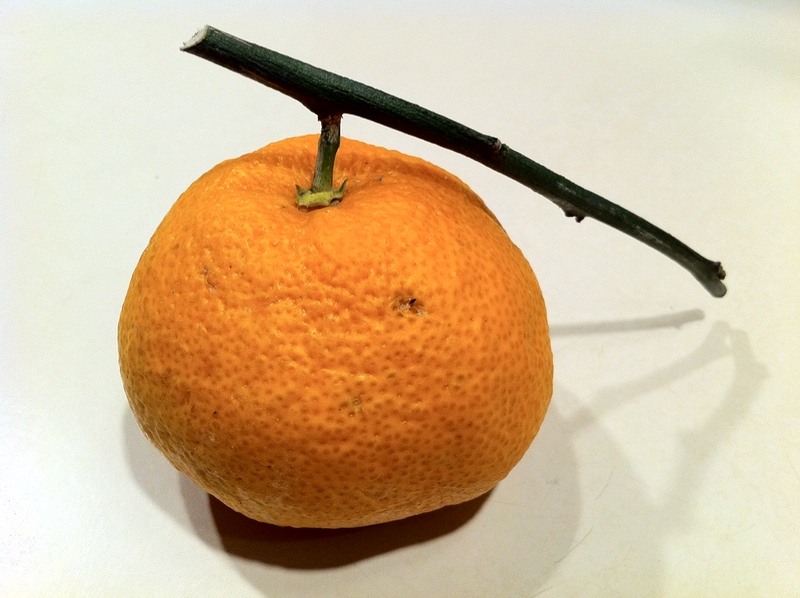 I recently tried an orange that I have never eaten before: satsuma. I got a box of satsuma oranges at Wegmans right after new years. These are the oranges that are used in Abita’s Satsuma Harvest Wit beer. An excellent summer beer! I got to have a few when I went to New Orleans this summer. I would recommend trying it with a summery salad. Satsuma oranges are pretty interesting. They are surprisingly heavy for their size. They are so juicy! The small oranges are easy to peel, great to eat just as they are, but they are nice for juicing because they have so much packed inside. They looked interesting to me in the store because the growers leave a piece of stem and leaves attached to the fruit when they pick it. I would get these again if I could find them at the market or in a grocery store but I haven’t seen them available anywhere else. Last Friday, we ordered take out. I really wanted Vietnamese so we ordered from Rice and Noodles. I always get a vermicelli salad bowl but Dan suggested trying something different this time. We decided to get one of the Banh Mi sandwiches. The first time I had one of these sandwiches was in NYC in the East Village. 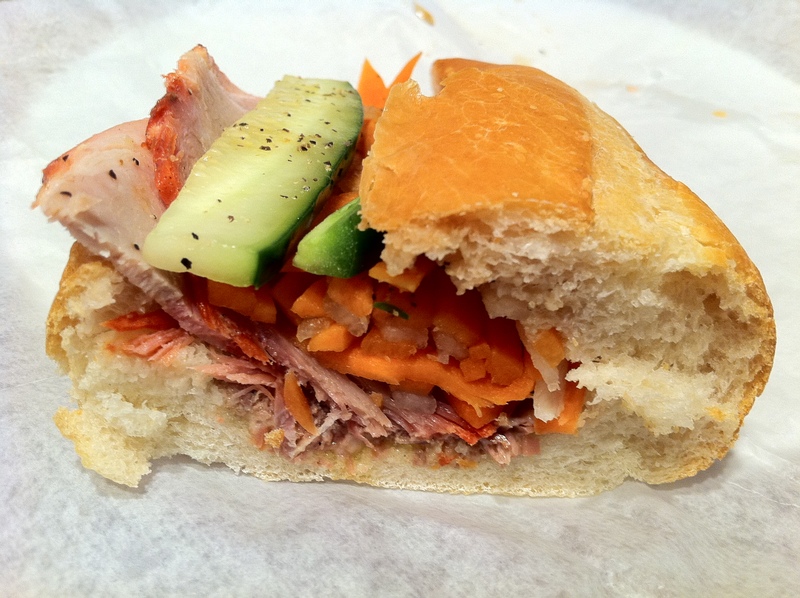 I visited Nicky’s Vietnamese sandwich shop because I saw it featured on a Food Network show. That place had bangin’ sandwiches! I tried a classic one with the chicken liver pate and one with a grilled pork chop. I really liked Nick’y version that included cilantro, carrot, and cucumbers on a crispy toasted bun. It’s made with their own homemade rolled ham with chicken liver pate. It’s built on a short loaf of French bread. They also make their own mayonnaise. The other additions include Chinese radishes, carrots, sliced onions, a thick slice of English cucumber and a sliver of jalapeno. I would recommend it! I thought it was really good and I am happy I tried something new.